As the leader in the fabric building industry, Arizon is committed to ensure its buildings are the most energy efficient option on the market. We understand that initial construction costs represent only part of the story, and that our customers want a “green” design to help keep operating costs low for decades. Below you will find a few of the features we use to keep ongoing costs to a minimum. 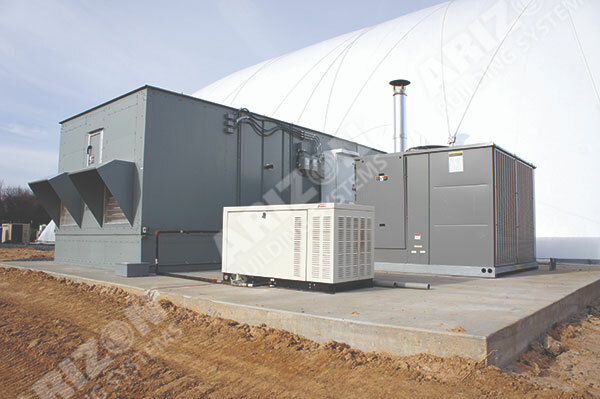 Arizon is the only fabric building manufacturer that designs and builds its own inflation, heating, and cooling systems. Arizon uses Air Rotation technology to provide even temperatures throughout the interior space from corner to corner and from floor to ceiling. This even distribution is achieved by a low horsepower, dual-fan design that keeps operating costs much lower than the competition’s off-the-shelf systems. Read more on our Mechanical System! 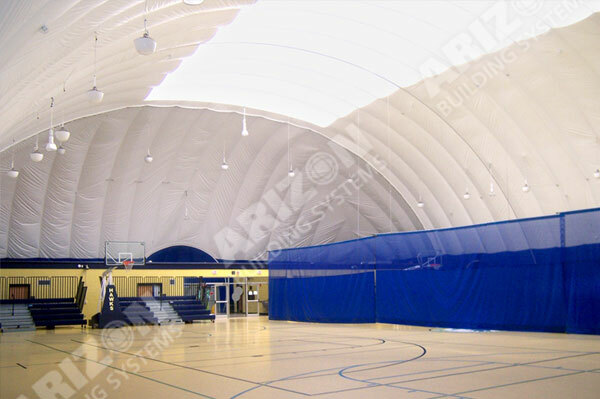 A majority of Arizon’s air-supported buildings feature a fabric skylight design that utilizes translucent fabric over the center of the dome. This design allows enough natural light for most activities without the need for artificial lighting during daytime hours, while minimizing the solar heat gain in the space during the summer months. Alternatively, many of our seasonally-installed domes feature a fully-translucent dome that brings in even more light and take advantage of the heat gain during the winter. 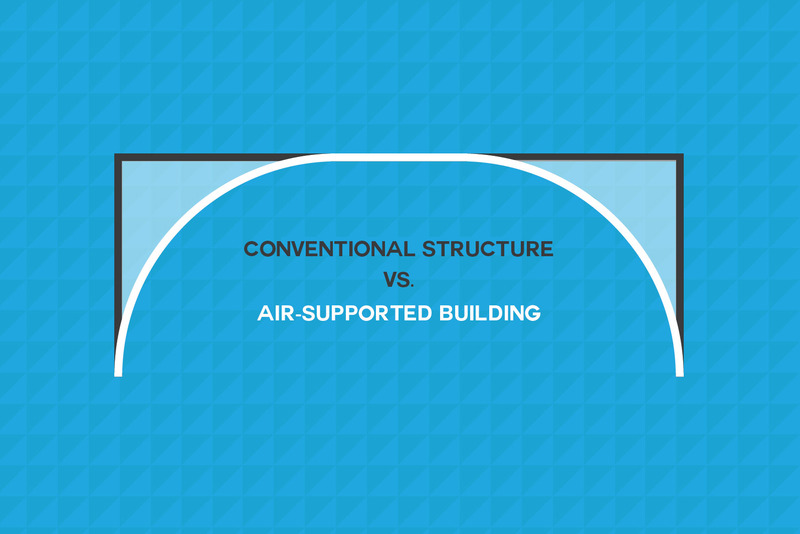 Due to the designed slope of the roof profile, an air-supported building will feature significantly less surface area than most conventionally-built structures of the same height. As the image at right depicts, there will also be much less unnecessary interior space which would otherwise require additional energy to heat or air-condition. Gone are the days of the 1000 Watt metal halide that you remember from gym class. 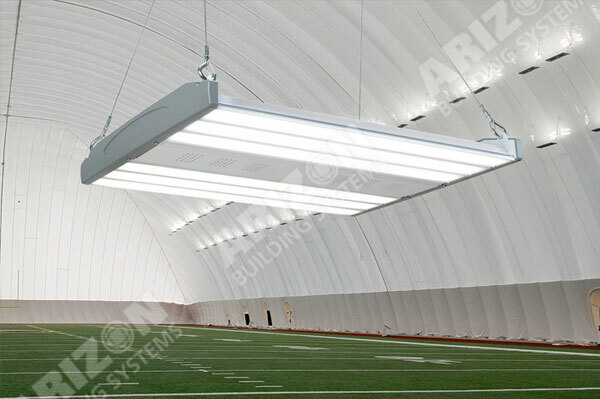 Arizon now offers a highly efficient LED fixture that operates at nearly 5 times the efficiency of metal halide lights. Beyond utility savings, our LED fixtures feature lifespans of over 60,000 hours without the need to hire an electrician and rent a lift to change bulbs. See More on our LEDs! 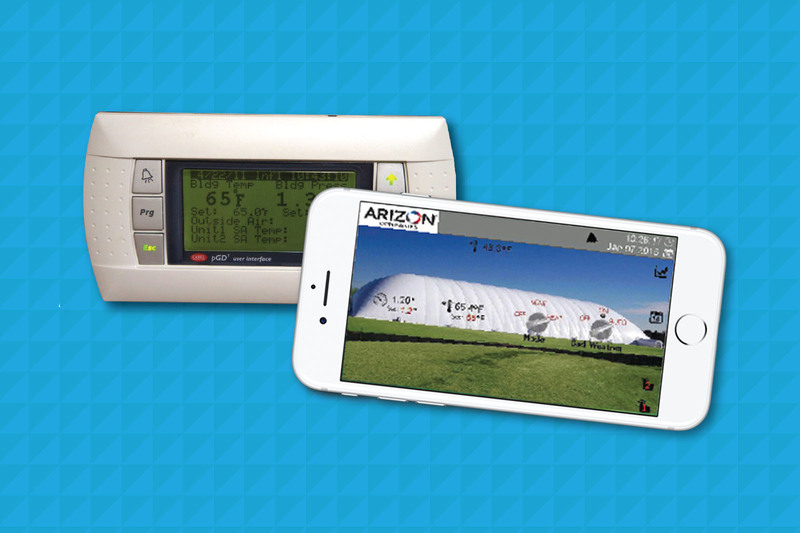 Arizon’s in-house controls team has developed multiple intuitive platforms that makes it easy for an air-supported building operator to schedule temperature setpoints and setbacks from on-site or anywhere around the world via computer,smart phone or tablet. Just as is the case with your home heating and cooling system, the simplest way to maximize the energy efficiency of your HVAC system is to strategically schedule the times of day it is operating at peak. See More on our Controls! Arizon offers a triple-wall with Mylar insulation option for additional energy efficiency versus the more standard double-wall construction. 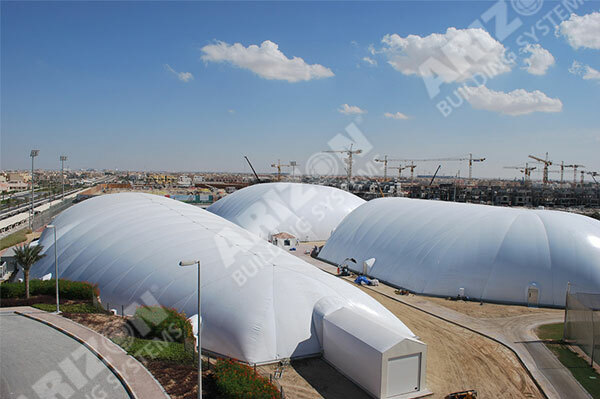 This type of construction features a layer of flexible Mylar film that is sandwiched between the interior and exterior layers of architectural fabric. The highly reflective nature of Mylar film makes this an optimal choice for applications in warm weather environments with a significant demand for air conditioning.